Nearest: Tube Station: Green Park 334 yards (305 metres), Railway Station: London Charing Cross 0.9 miles (1.4 km), DLR Station: Tower Gateway 3 miles (4.9 km), Motorway: M1 Junction 1 5.7 miles (9.2 km). Within a 0.5 miles (0.8 km) circle of the hotel are 4 tube stations (underground system). The Holiday Inn Mayfair is located in the prestigious and fashionable area of Mayfair. The hotel is situated on Berkeley Street (a small street which is used as a through route so remains busy most of the day) yards from Piccadilly where the famous Fortnum and Mason store is located. Piccadilly borders Green Park which makes up part of the grounds of Buckingham Palace. This location is right in the heart of London and is surrounded by major attractions and shopping. Almost opposite the hotel is the Palm Beach Casino with many more casinos in the surrounding area. A short walk to the east is Bond Street, known internationally for its high class jewellery and fashion shops. Just beyond Bond Street is Regent Street which marks the start of the West End and Theatreland. The Street itself is a long winding road with a host of shops and restaurants with areas like Soho adjacent. Oxford Street is 0.5 miles to the north and provides more conventional shopping geared to the London visitor. As well as being close to Green park another major park within walking distance is Hyde Park, where you will find enough to and see to keep you interested for a whole day in this one park alone. Other selected nearby attractions include the Michael Faraday Museum (0.14 miles), Royal Academy of Arts (0.16 miles), St James's Palace (0.3 miles), Piccadilly Circus (0.36 miles) and Buckingham Palace (0.4 miles). The biggest attraction in London is the London Eye which is 1 mile just on the south side of the River close to the Houses of Parliament. Modern yet traditional purpose built hotel, The Holiday Inn Mayfair has a great central location. All rooms are en-suite (bath, hairdryer) and amenities include individually controlled air conditioning, Cable TV with pay movies, high speed wireless Internet access (charges apply), Coffee/tea Maker, flat screen TV with PPV, Double Glazed Windows, Safe, Iron / Ironing Board, Mini Bar, 2 direct dial phones with Voice Mail, Separate Hanging Closet, Trouser Press and Work Desk with Lamp. Blackout curtains ensure a good nights sleep. The hotel has an executive floor where rooms enjoy a free morning newspaper. These are upgraded rooms compared to standard rooms with extras such as bath robes and scale in the bathroom. Suites also have as the executive extras with more amenities such as a CD/DVD player. Four bedrooms are specially adapted to assist with accessibility. Smoking and non-smoking options. Room service is 24 hours. Daily maid service. Nightingales Restaurant: Serves breakfast and dinner in an informal atmosphere and elegant setting and located on the ground floor. A La Carte restaurant. Menu is modern British with an international twist. Steaks cooked to order. Modern retro design with Chandeliers hang from the ceiling. Furnished with dark wood tables and chairs and contemporary colour photographs of iconic landmarks and scenery in London. Open every day. Nightingales Lounge and Bar: Drinks served to the sound of relaxing music. Snack menu also on offer and is chosen by many guests as the place for lunch. Large screen plasma television shows live major sporting events. Open from 11.00 till 01.00. The hotel has two meeting rooms which are air-conditioned and designed to make sue of natural daylight. The largest room can handle up to 100 guests reception style. Equipment includes Projector, DVD Player, Flip Chart and Markers, Lectern and Whiteboard. he hotel caters to the need of the business traveller and onsite you can make use of the following facilities: Copying, courier, secretarial services, computer hire, fax, mobile phone rental and internet access including WiFi. Additional services include concierge services, same day dry cleaning and currency exchange. The hotel is air-conditioned and the front reception can provide safety deposit facilities. Public parking is available on site and costs £45 per day. Holiday Inn Oxford Circus Hotel: is 0.6 miles (0.9 km) away, has a guest satisfaction score of 71% and rates start from about £104. Holiday Inn Regents Park Hotel: is 0.9 miles (1.5 km) from here, earns a customer rating of 81% and base rates begin at about £105. Holiday Inn Bloomsbury: 1.3 miles (2.1 km), rated at 80% and with rates from around £114. Holiday Inn Kensington Forum: 2.0 miles (3.3 km), rated at 74% and with rates from around £101. Compared to other London hotels: This hotel has been rated 80% by past guests. The London average is 80% and the average for 4 star hotels is 83%. Therefore this hotel is below average for its sector (star rating) . Holiday Inn Hotels across the chain average 79% so this hotel is just above the average rating for Holiday Inn hotels. Milesfaster ranking: 450th from 866 London hotels, 12th of 26 Holiday Inn Hotels, and 208th of 328 four star rated hotels. Another to Consider: A comparable type of hotel close by (0 miles, 0.0 km) would be the 4 star Doubletree By Hilton Tower Of London, with base rates beginning from £119 and which has an 89% guest satisfaction rating. The Doubletree By Hilton Tower Of London also offers: free WiFi. Prefer a tried and tested hotel close by judged by its guests ratings? We think the 5 Star South Place Hotel stands out in that regard, it's only 0.7 miles (1.1 km) from here. The South Place Hotel has an extremely high guest rating of 97%, one of the best rated London hotels. 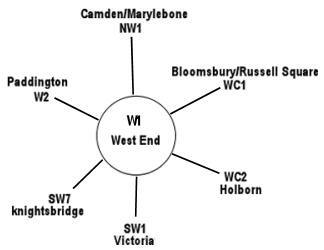 The fifty hotels that are closest to this location (3 Berkeley Street, W1 postcode) which we list extend for a 0.6 miles (0.9 km) radius. They are made up of 32 five star hotels (average rating 87%), 17 four star hotels (average rating 83%) and 1 three star hotel (rated 88%). Top 4 star hotel is Chesterfield Mayfair Hotel at 98%. Top rated of the local hotels are The Beaumont London (5 star), the Four Seasons Hotel Park Lane (5 star), the Soho Hotel (5 star) and the Haymarket Hotel (5 star) (all 4 are joint top with 99%). Base Rates: Base rates can indicate the lowest available rates for a particular hotel. This is a good general guide but as base rates do not account for special offers and one off deals they can only be a rough guide. The average base rate for all the areas hotels is £304 per night. From a low of £79 at Park Lane Mews Hotel (4 Star, 65%) and the highest rates top out at £1000 at 45 Park Lane Hotel (5 Star, 98%). The following are the averages for each star level: Five Star average: £390, Four Star average: £155 and Three Star average: £109. Using our in-house algorithm we rank hotels based on guest ratings and weighted for related factors we rank Holiday Inn Mayfair Hotel 38th (joint) of 50 area hotels and 11th (joint) for the 17 four star hotels in the area. We rank the hotel 14th of 50 (13th of 17 four star hotels.) for base rates. We rank this hotel based on rates and also review scores to place it 28th of 48 of all the closest hotels in terms of value for money (Haymarket Hotel was top). Timeline: November 2010. £85,000 refurbishment of restaurant and lounge. DDirections: Hotel is located on a one-way section of Berkley street and must be approached from the North. From Piccadilly you need to come in from Stratton Street and turn right onto Berkeley Street. The other option is to come in via Berkeley Square.